After my 10K on 10/31, I watched the New York City marathon for hours, cheering on friends and teammates. Rather than experiencing total runner FOMO, it got me pretty pumped about (hopefully, assuming no injuries or illness) running the race next year. NYC 2016 will be my first marathon. And maybe my only marathon (famous last words for runners). But let’s focus on making it to that starting line first. After mainly taking spin and yoga my first 2 months with ClassPass, I decided to try to branch out a little with rowing classes at Row House. Most of their classes are a Full Body 50, which incorporates different speed/strength workouts on the Erg, then a bit of HIIT and other bodyweight moves interspersed. I usually warm up with 2000m on the erg at the gym, but I’ve never tried crew or anything and didn’t know how weak my form was. I was focusing more on strokes/minute but not really noticing my split times. The instructors at Row House are very helpful on getting you to slow down and assess your form before speeding up and trying power strokes. I took my first class at the Chelsea location and was sore in my arms and shoulders for 2 days after. I immediately signed up for more classes at the Columbus Circle location with Matt. Both studios are clean and modern (if a bit cramped in the locker room/bathroom areas) and have good playlists pumping along with the ability to dim the lights in crucial push moments. The workout has left me around a 7 on a scale from 1 to dripping with sweat. I’m taking another Row House Full Body 50 on the morning of Black Friday, which I assume will shake me out of my post-Thanksgiving slump. I finally tried Flywheel at the Chelsea location and was a fan. my instructor Johnny was super high-energy and I ended up in the front row, so I felt like I was giving some energy right back. I came in 3rd in the class, which made me want to work even harder the next time. I’m having the best time reading Flywheel bios. What would mine say? I also love the “Never Coast” shirts and gear, which is amusing since I really enjoy coasting while on a real bike outside. My experience fly-ing so far makes me want to try FlyBarre as well since I’ve only been to PureBarre and have yet to experience much barre variation. 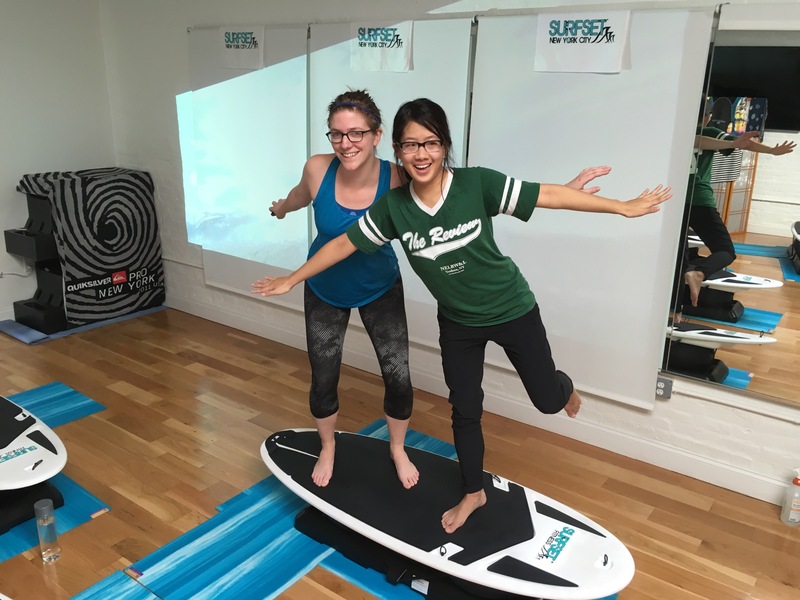 My most outside-the-box ClassPass experience so far has been at SurfSet, where you work out on surfboards that sit on top of 3 large balls. You use your core a lot to stabilize while doing the moves (lunges, planks, push ups, etc). I left feeling sore in my core after my first class, then had some thigh DOMS more after my second. The instructors (Diana and Aaron) are super helpful for newbies and will offer modifications for those who want to keep it simple or people who feel comfortable and want to kick it up a notch. And yes, they will totally take your picture on a surfboard for you afterward.